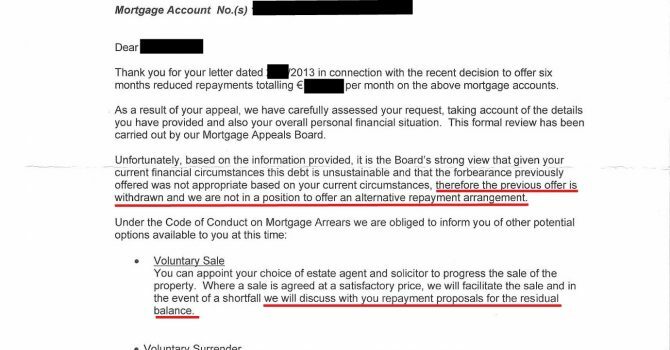 2013 the year banks told borrowers to hand back the keys? 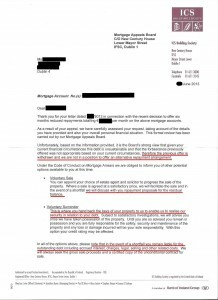 One such document was received by a client recently from the Irish Civil Service building society, also known as ICS and a subsidiary of Bank of Ireland. It’s no secret that posting these documents makes us highly disliked by the banks, but if people don’t expose them then the great farce will go unchallenged. What makes this case interesting is that the bank offered a short term forbearance plan which the client asked them to tweak. Then they turned around and changed their mind and went from ‘we can give you a few months to get your affairs in order’ to ‘sell the house or even abandon it’. 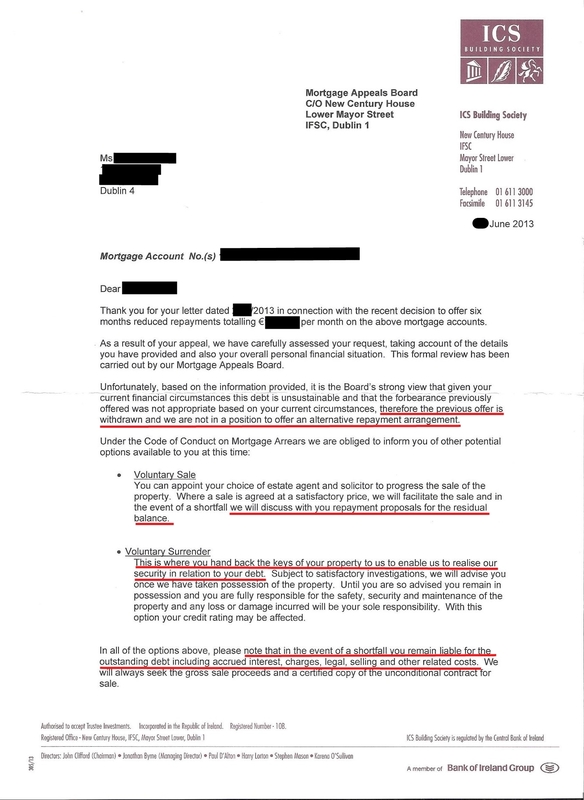 In 2008 to now I have never heard a bank say that walking away (also called jingle mail – where you hand back the keys) is an option, they might tell you the repercussions of doing that but it doesn’t come into written advice in terms of your choices. And when your options are ‘sell with consent or leave’ then that falls into the area known as a ‘Hobson’s choice’. Something unique to this case is the location, we have never seen such a letter for a person in Dublin 15, in a rural area, or areas where sales are slow, but in Dublin 4 there is a shortage of family homes, this property doesn’t have a huge amount of negative equity and the bank know from their mortgage draw-downs that properties are closing above their listing prices in many instances. Could that be why they don’t want to negotiate? Or even stick to the deal they offered to begin with? This came after the client informed all other creditors that they were going to lose out as the mortgage would be prioritised (in this instance the issue was overall indebtedness), the client did everything right. It may be that banks have a view of tackling deep arrears (they say this, whether or not it’s happening is anybody’s guess, we’ll have to wait for it to show up in the arrears figures), but it could also be a case that they go for quick win cases just as fast before they deteriorate further. So what do we do now? The same thing we always do, mire the bank down with problems by using the regulation most people are not aware of against them, it’s not an ideal way of doing it, but it buys time.